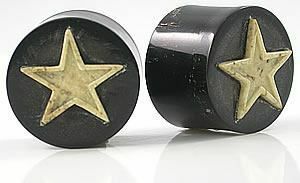 Horn Plug with Walrus Bone Flat Star - Price Per 2 Please Note: All Natural Jewelry will vary slightly in color and size. We do our best to match up the two most alike. Since our Natural Line is made from the best Craftsman there is very little variations between pieces. https://www.painfulpleasures.com/horn-plug-with-walrus-bone-flat-star-price-per-2.html?___store=1 3599 Horn Plug with Walrus Bone Flat Star - Price Per 2 https://cdnstoremedia.painfulpleasures.com/media/catalog/product/o/r/org506.jpg 29.99 29.99 USD InStock /Body Jewelry/Plugs and Tunnels /Body Jewelry/Plugs and Tunnels/Plugs/Double Flared Plugs /Body Jewelry/Organic Body Jewelry /Body Jewelry/Organic Body Jewelry/Elementals Organic Horn Jewelry Collection /Body Jewelry/Organic Body Jewelry/Elementals Organic Horn Jewelry Collection/Organic Horn Plugs /Body Jewelry/Organic Body Jewelry/Abalone, Bone & Mother of Pearl Organic Jewelry /Body Jewelry/Organic Body Jewelry/Abalone, Bone & Mother of Pearl Organic Jewelry/Bone Jewelry/Bone Plugs & Tunnels /Body Jewelry/Organic Body Jewelry/Abalone, Bone & Mother of Pearl Organic Jewelry/Bone Jewelry /Body Jewelry/Organic Body Jewelry/Abalone, Bone & Mother of Pearl Organic Jewelry/Bone Jewelry/Elementals Walrus Bone Jewlery /Body Jewelry/Organic Body Jewelry/Abalone, Bone & Mother of Pearl Organic Jewelry/Bone Jewelry/Elementals Walrus Bone Jewlery/Walrus Bone Plugs /Body Jewelry/Plugs and Tunnels/Plugs/Organic Plugs/Bone Plugs /Body Jewelry/Plugs and Tunnels/Plugs/Organic Plugs/Horn Plugs /Body Jewelry/Organic Body Jewelry/Organic Plugs & Tunnels /Body Jewelry/Plugs and Tunnels/Plugs /Body Jewelry/Plugs and Tunnels/Plugs/Organic Plugs /Body Jewelry/Plugs and Tunnels/Plugs & Tunnels by Size /Body Jewelry/Plugs and Tunnels/Plugs & Tunnels by Size/7/16" to 15/16" Plugs & Tunnels (11-24mm) /Body Jewelry/Plugs and Tunnels/Plugs & Tunnels by Size/1" to 3" Plugs & Tunnels (25-50mm) Horn Plug with Walrus Bone Flat Star - Price Per 2 Please Note: All Natural Jewelry will vary slightly in color and size. We do our best to match up the two most alike. Since our Natural Line is made from the best Craftsman there is very little variations between pieces. USD 3600 Horn Plug with Walrus Bone Flat Star - Price Per 2 - 14mm ~ 9/16" 29.99 29.99 https://cdnstoremedia.painfulpleasures.com/media/catalog/product/o/r/org506.jpg InStock 14mm ~ 9/16" 3601 Horn Plug with Walrus Bone Flat Star - Price Per 2 - 18mm ~ 11/16" 35.49 35.49 https://cdnstoremedia.painfulpleasures.com/media/catalog/product/o/r/org506.jpg InStock 18mm ~ 11/16" 3602 Horn Plug with Walrus Bone Flat Star - Price Per 2 - 16mm ~ 5/8" 35.49 35.49 https://cdnstoremedia.painfulpleasures.com/media/catalog/product/o/r/org506.jpg InStock 16mm ~ 5/8" 3603 Horn Plug with Walrus Bone Flat Star - Price Per 2 - 26mm ~ 1-1/16" 37.49 37.49 https://cdnstoremedia.painfulpleasures.com/media/catalog/product/o/r/org506.jpg InStock 26mm ~ 1-1/16"